Welcome from sunny Cambridgeshire, its lovely here today after the overnight rain. I was going to say we had had no rain for 3 days but last night it poured. WIP's - this week I am working on the Ten Stitch - I always panic when I add a light round, but with so many more rounds to do I know this will work in well. As I have to make another of these matching, I am having to be careful not to exhaust all the colours. The V necked cardigan is coming along, I still have the sleeves to knit. I am working on the front band. I would of had this done last night but realised I had knitted 2 right fronts, so needed to pull back and start again. That's what happens when you talk and knit at the same time and don't pay attention to which side you are shaping on! I joined a new (to me) knitting group yesterday. They meet every Tuesday afternoon at the Dolphin Hotel in St Ives. I'm not sure if I can make every Tuesday but its nice to have somewhere else to knit. Thank you ladies. 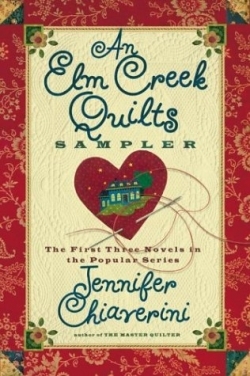 On the reading front I am on the last few chapters of the Cross Country Quilters. I have enjoyed this book. Yes its predictable but its sometime good to have something light to read. I've been looking at that blanket! It's nice to see it knit up by someone I "know". I think I have plenty of scraps to knit this but I am working on other projects for now. The light color looks great!! Nice! that blanket is great. Very much on my list of things I want to make! Wasn't it glorious today? They say snow by the end of the week! I am loving your blanket - the colours are fabulous. A new knitting group, how wonderful! Maybe the blanket would be a better project to work on with the group because it doesn't require as much thought? I definitely cannot knit something intensive while with other knitters. I never tire of that blanket! It's just completely brilliant. Just popping over from Tamis, Ive decided to give the wip wednesdays a go. The blanket is looking great and hope you enjoy your group. I always find that blanket fascinating, I would love to try something like that sometime! Very cool blanket, I love the pattern! I've heard these books are good, but haven't dived into them yet. The blanket looks great, I really like the light round. I have had the ten stitch in my queue for awhile and I need to get going on it. Just love that blanket. The colours are wonderful.